A mutual fund updates its net asset value once a day. Unlike stock and other securities prices, a mutual fund’s share price, or net asset value, updates only at the end of each trading day rather than constantly. During market hours, a mutual fund’s investments and shares outstanding fluctuate, which makes it tough to nail down an exact NAV. When markets close, it gathers the closing price of every security it owns and calculates its NAV, which is widely reported on financial websites. When you buy or sell shares throughout the day, the NAV at the end of that day represents the approximate price you pay or receive. Visit any financial website that provides market information (see Resources for some examples). Click the “Get Quote” text box and type a mutual fund’s ticker symbol. This symbol is a five-letter abbreviation ending in “X” that identifies a specific fund. Alternatively, type a mutual fund’s name in the text box. Some websites show a list of suggestions once you begin typing, from which you can select a specific fund. For example, assume you want to check the price of the hypothetical Global Stock Fund whose ticker symbol is ABCDX. Type “ABCDX” in the text box, or begin typing “Global Stock” and select the fund from the list of suggestions. Click the “Get Quote” button to pull up the mutual fund’s quote page. 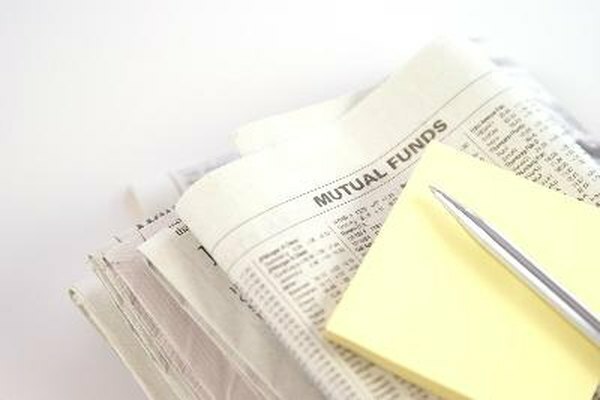 Find the fund’s NAV at the top of the page and identify the adjacent date to determine the mutual fund’s share price at the close of that day’s trading. In this example, assume the fund’s price is $101 as of June 1. If you check the price on the morning of June 2, it will still show $101 until the fund calculates its new NAV after markets close on June 2. Identify the positive or negative dollar figure and percentage next to the NAV. These represent the amount and percentage by which the mutual fund increased or decreased from the previous closing price. A website typically shows the figures in green font with an up-arrow to designate an increase and uses red font and a down-arrow for a decrease. In this example, assume the quote reports “$1.00 (1%)” in green with an up-arrow. This means the fund price increased by $1.00 and by 1 percent since the previous close. Click “Historical Prices” on the main quote page to view a list of the mutual fund’s NAV on recent trading days. Type a date in the “Start Date” and “End Date” boxes at the top of the page and click “Get Prices” to review historical NAVs for a specific date range. For example, to view the mutual fund’s NAV for the month of November 2015, input Nov. 1, 2015, as the start date and Nov. 30, 2015, as the end date. If a fund charges “loads” or other fees to buy and sell shares, your price may vary from the NAV. Contact the mutual fund provider or financial institution that offers shares to determine your specific price.